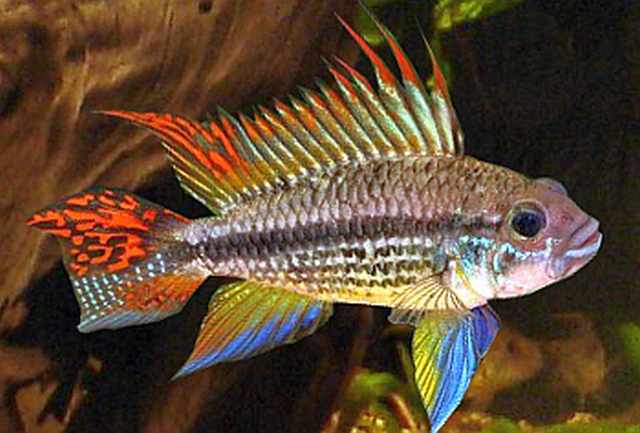 The Cockatoo Dwarf Cichlid (Apistogramma cacatuoides) is found in the streams, backwaters and tributaries of the Ucayali, Amazon and Solimões rivers in the Amazon River basin, and from the Pachitea River to Tabatinga in Peru and Columbia. Tropical fish keeping enthusiasts also refer to the Cockatoo Dwarf Cichlid as the Double Full Red Cockatoo Cichlid, the Cockatoo Dwarf Cichlid, or the Big Mouth Apistogramma. These beautiful cichlids prefer living in the smaller, shallow, leafy bottomed streams and lagoon type backwaters of the rain forests where they can easily hide from larger predators. 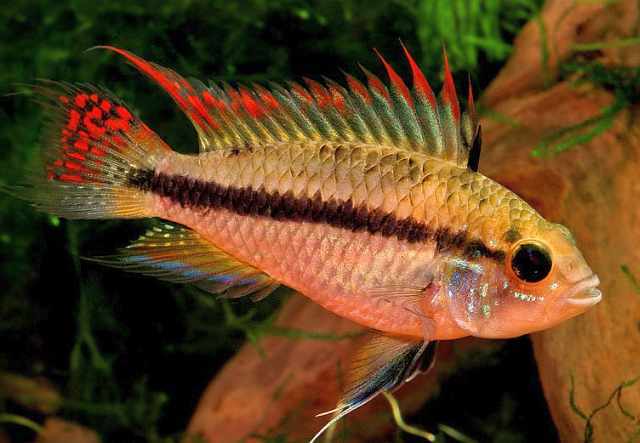 Apistogramma cacatuoides is widely bred in captivity for tropical fish keeping enthusiasts and unlike many of the other Dwarf Cichlids, is not threatened by extinction. The Cockatoo Dwarf Cichlid has blue, yellow and red color forms that occur naturally in their native habitats. Tropical fish keeping enthusiasts have developed several other more color intense varieties through selective breeding. The male Cockatoo Dwarf Cichlid has a noticeably elongated body shape, is larger than the female, and has very long prominent rays in the dorsal fin and bright coloration as compared to the smaller fins and drabber brownish/yellowish background body color of the female. Males grow up to 3.5 inches and the smaller females max out at around 2.5 inches. The mouth of these cichlids is rather large with thick lips. The males are much more colorful than the females and usually have red/orange dorsal and caudal fins. The ventral fins are clear and the leading 3 or 4 hard rays are elongated. Females lack the elongated dorsal rays of the male, and their ventral fins show a black leading edge. Their background body color is a dull pale yellow with a clear black line running along the flank. they lose their black lateral band which is replaced by a black side spot. Both sexes have the dark line that leads from the eye to the bottom of the gill flap. The Cockatoo Dwarf Cichlid is best kept in a densely planted aquarium of at least 30 gallons with a sandy or very fine gravel substrate, some caves and driftwood roots for them to hide in, or (in a biotope setup) some Indian Almond Leaves on the bottom of the tank. These cichlids are well suited for planted aquariums but need plenty of swimming room. Because the males and females are territorial, Cockatoo Dwart Cichlids should be kept in pairs, trios of one male with two females, or in harems of one male with several females. 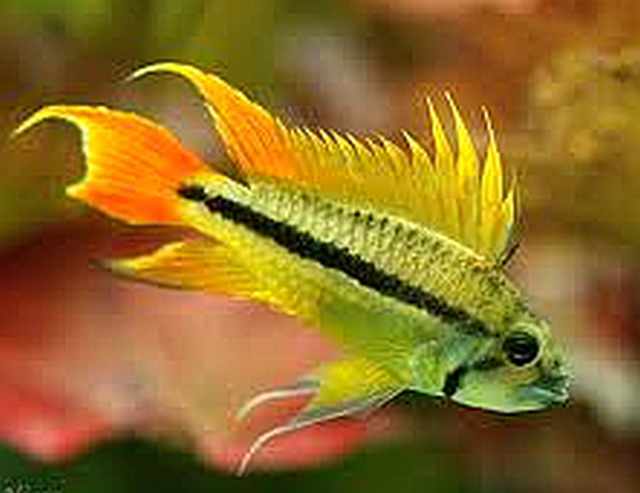 They can be housed with tetras and other peaceful species without any problems but Apistogramma cacatuoides are timid and should never be kept with larger, aggressive species. Although these are one of the few South American Dwarf Cichlids that can tolerate alkaline water, they require good water conditions and should be given regular water changes for them to stay healthy. The Cockatoo Dwart Cichlid is an egg layer that prefers spawning in caves. After the female lays her eggs, the male will follow her and fertilize them. The male then leaves the brood to the female to care for. The fry are free swimming in 7 to 10 days, at which time they should be provided newly hatched brine shrimp. They grow quickly and will attain sexual maturity in around five months. Cockatoo Dwart Cichlids are carnivores that will eat a variety of foods. Live, frozen, and freeze dried bloodworms , tubifex , brine shrimp and a quality flake food will all be eagerly be accepted. Despite being widely bred by tropical fish keeping enthusiasts, Cockatoo Dwart Cichlids are not always available in tropical fish shops. When they are available for purchase, they are usually 1″ to 1-1/2″ in length.